We had the pleasure and opportunity of being interviewed by RJ of AutoDeets.com. RJ is known for finding the latest and greatest in the automotive scene and interviews businesses to gain knowledge and provide his audience with helpful tips within the automotive realm. 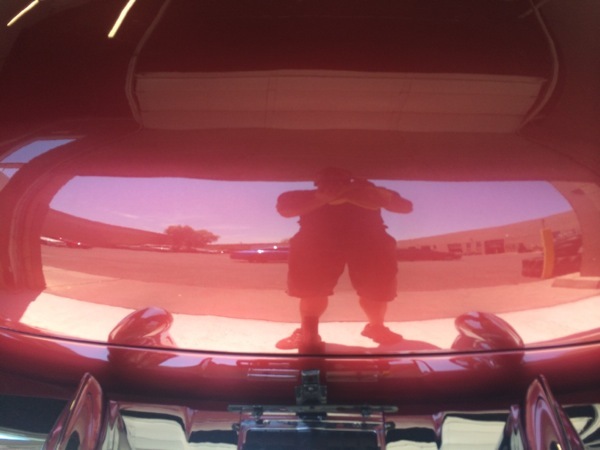 He wanted to interview Detail Boss to ask us a variety of questions pertaining to our customers, our likes, and pick our brains about auto detailing.Here is our interview with him. Another 9 custom classics and 2 automobilia detailed for Barrett Jackson Scottsdale 2015! We ensured every blemish from the time each vehicle was painted and built were removed before they were delivered to the auction. Since most of the vehicles were black, much attention was needed to make each and every one of these pieces look like a million bucks. Paint correction was key, but it was the fine details under the hoods and in each interior that tied the vehicle's appearance together at the end. We also had fellow members of the Detail Mafia and Detailer's Network intern with us for part of the duration of this detail-extravaganza. Both traveling from Washington state, Bill The Buffman's Shae Morissey and Clean Planet Auto Detailing's manager Gabriel spent a couple days jeweling out the '52 Cadillac roadster with us. Ken Crone of Shiner's Auto Detailing from Monterray, CA spent most of the time with us on several of the cars. We want to thank everyone who made this project possible. The detailer's who pitched in and worked as a team with us truly made this auction one of the best ones yet! You all are like family. Thank you to the guys at Memory Lane Auto Brokers for your continued business, loyalty, and friendship! Until next time. Enjoy the gallery! We did it: ten more cars (including a trailer) detailed and polished for Barrett Jackson Auto Auction; this time for Reno, Nevada. Each car received anywhere from spot sanding to remove scratches, panel sanding to remove imperfections and orange peel, as well as our stage 2, signature, and concours level details. The cars we did were 2 custom Cadillacs, a beautiful 1967 GT500 Eleanor Mustang, two custom pickup trucks (Ford and Chevrolet), three corvettes (one was a 1957 with a 427 motor and modernized interior with all digital gauges and push to start), a Volkswagen Thing (Alcopoco edition), and a custom mustang trailer. Upon completion of the exteriors of the vehicles, all jambs/nooks and crannies were dusted and cleaned, engine bays detailed, and interiors freshened up and leather seats conditioned. With a thin layer of tire-shine, they were ready for the auction block. A huge thanks again to our friends and partners at MLAB (Memory Lane Auto Brokers) for always entrusting us to make the vehicles look the best they possibly can and continued business. This auction was a huge feat for us as a detailing company as well as MLAB as a custom classic car restoration facility. Many more great things to come! Barrett Jackson will be returning to Scottsdale Arizona this January and will be held in Las Vegas at the end of September! Enjoy the pics!